The name of a family of Maranos in Mexico at the end of the sixteenth century and the beginning of the seventeenth, all connected with Don Luis de Carabajal, governor of New Leon. Several members of the family suffered martyrdom at the stake for Judaizing. 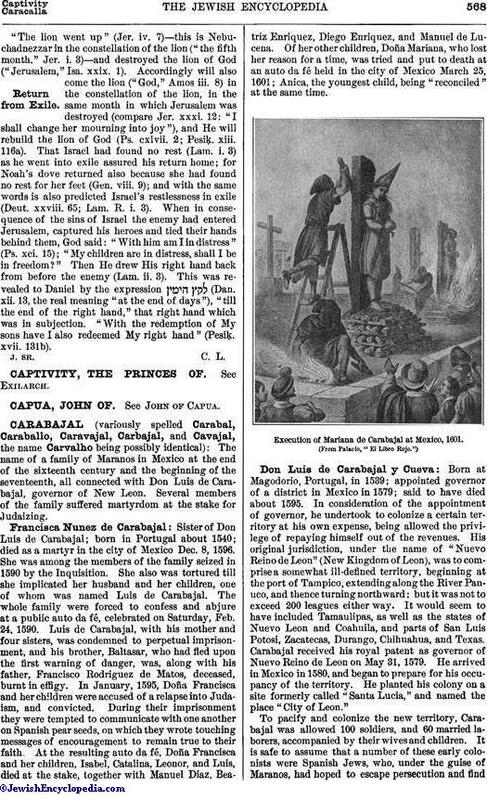 Sister of Don Luis de Carabajal; born in Portugal about 1540; died as a martyr in the city of Mexico Dec. 8, 1596. She was among the members of the family seized in 1590 by the Inquisition. She also was tortured till she implicated her husband and her children, one of whom was named Luis de Carabajal. The whole family were forced to confess and abjure at a public auto da fé, celebrated on Saturday, Feb. 24, 1590. Luis de Carabajal, with his mother and four sisters, was condemned to perpetual imprisonment, and his brother, Baltasar, who had fled upon the first warning of danger, was, along with his father, Francisco Rodriguez de Matos, deceased, burnt in effigy. In January, 1595, Doña Francisca and her children were accused of a relapse into Judaism, and convicted. During their imprisonment they were tempted to communicate with one another on Spanish pear seeds, on which they wrote touching messages of encouragement to remain true to their faith. At the resulting auto da fé, Doña Francisca and her children, Isabel, Catalina, Leonor, and Luis, died at the stake, together with Manuel Diaz, Beatriz Enriquez, Diego Enriquez, and Manuel de Lucena. Of her other children, Doña Mariana, who lost her reason for a time, was tried and put to death at an auto da fé held in the city of Mexico March 25, 1601; Anica, the youngest child, being "reconciled" at the same time. Execution of Mariana de Carabajal at Mexico, 1601. Born at Magodorio, Portugal, in 1539; appointed governor of a district in Mexico in 1579; said to have died about 1595. In consideration of the appointment of governor, he undertook to colonize a certain territory at his own expense, being allowed the privilege of repaying himself out of the revenues. His original jurisdiction, under the name of "Nuevo Reino de Leon" (New Kingdom of Leon), was to comprise a somewhat ill-defined territory, beginning at the port of Tampico, extending along the River Panuco, and thence turning northward; but it was not to exceed 200 leagues either way. It would seem to have included Tamaulipas, as well as the states of Nuevo Leon and Coahuila, and parts of San Luis Potosi, Zacatecas, Durango, Chihuahua, and Texas. Carabajal received his royal patent as governor of Nuevo Reino de Leon on May 31, 1579. He arrived in Mexico in 1580, and began to prepare for his occupancy of the territory. He planted his colony on a site formerly called "Santa Lucia," and named the place "City of Leon." To pacify and colonize the new territory, Carabajal was allowed 100 soldiers, and 60 married laborers, accompanied by their wives and children. It is safe to assume that a number of these early colonists were Spanish Jews, who, under the guise of Maranos, had hoped to escape persecution and findprosperity in the New World. In this expectation they were doomed to disappointment, for within a decade after their settlement a score of them were openly denounced and more or less severely punished for Judaizing. In 1590 there seems to have been an extensive colony of them in Mexico. 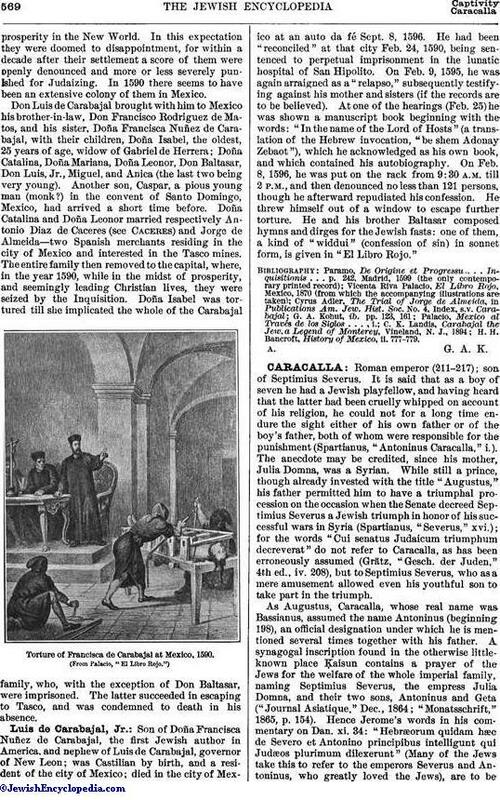 Don Luis de Carabajal brought with him to Mexico his brother-in-law, Don Francisco Rodriguez de Matos, and his sister, Doña Francisca Nuñez de Carabajal, with their children, Doña Isabel, the oldest, 25 years of age, widow of Gabriel de Herrera; Doña Catalina, Doña Mariana, Doña Leonor, Don Baltasar, Don Luis, Jr., Miguel, and Anica (the last two being very young). Another son, Caspar, a pious young man (monk?) in the convent of Santo Domingo, Mexico, had arrived a short time before. Doña Catalina and Doña Leonor married respectively Antonio Diaz de Caceres (see Caceres) and Jorge de Almeida—two Spanish merchants residing in the city of Mexico and interested in the Tasco mines. 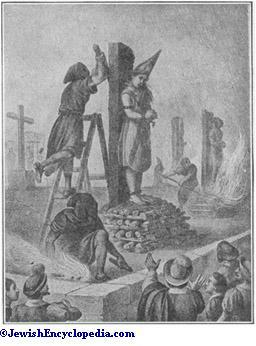 The entire family then removed to the capital, where, in the year 1590, while in the midst of prosperity, and seemingly leading Christian lives, they were seized by the Inquisition. Doña Isabel was tortured till she implicated the whole of the Carabajal family, who, with the exception of Don Baltasar, were imprisoned. The latter succeeded in escaping to Tasco, and was condemned to death in his absence. 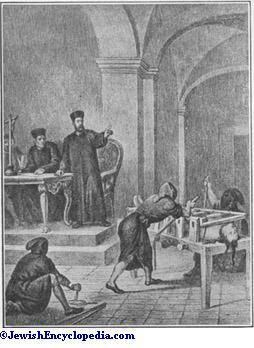 Torture of Francisca de Carabajal at Mexico, 1590. Son of Doña Francisca Nuñez de Carabajal, the first Jewish author in America, and nephew of Luis de Carabajal, governor of New Leon; was Castilian by birth, and a resident of the city of Mexico; died in the city of Mexico at an auto da fé Sept. 8, 1596. He had been "reconciled" at that city Feb. 24, 1590, being sentenced to perpetual imprisonment in the lunatic hospital of San Hipolito. On Feb. 9, 1595, he was again arraigned as a "relapso," subsequently testifying against his mother and sisters (if the records are to be believed). At one of the hearings (Feb. 25) he was shown a manuscript book beginning with the words: "In the name of the Lord of Hosts" (a translation of the Hebrew invocation, "be shem Adonay Zebaot"), which he acknowledged as his own book, and which contained his autobiography. On Feb. 8, 1596, he was put on the rack from 9:30 A.M. till 2 P.M., and then denounced no less than 121 persons, though he afterward repudiated his confession. He threw himself out of a window to escape further torture. He and his brother Baltasar composed hymns and dirges for the Jewish fasts: one of them, a kind of "widdui" (confession of sin) in sonnet form, is given in "El Libro Rojo." H. H. Bancroft, History of Mexico, ii. 777-779.